Valéry Marie René Georges Giscard d'Estaing, MCCF, (February 2, 1926 - ) is a French center-right politician who was President of the French Republic from 1974 until 1981. His tenure as President was marked by a more liberal attitude on social issues—such as divorce, contraception and abortion—and attempts to modernize the country and the office of the presidency, notably launching such far-reaching infrastructure projects as the high-speed TGV train and the turn towards reliance on nuclear power as France's main energy source. However, his popularity suffered from the economic downturn that followed the 1973 energy crisis, marking the end of the "thirty glorious years" after World War II, unfortunately combined with the official discourse that the "end of the tunnel was near." Furthermore, Giscard faced political opposition from both sides of the spectrum: From the newly-unified left of François Mitterrand, and from a rising Jacques Chirac, who resurrected Gaullism on a right-wing opposition line. All this, plus bad public relations, caused his unpopularity to grow at the end of his term, and he failed to secure re-election in 1981. He is a proponent of the United States of Europe and, having limited his involvement in national politics after his defeat, he became involved with the European Union. He notably presided over the Convention on the Future of the European Union that drafted the ill-fated Treaty establishing a Constitution for Europe. He took part, with a prominent role, in the annually held Bilderberg private conference. He also became involved in the regional politics of Auvergne, serving as president of that region from 1986 to 2004. He was elected to the French Academy, taking the seat that his friend and former President of Senegal Léopold Sédar Senghor had held. As a former President, he is a member of the Constitutional Council, a prerogative that he has chosen to exercise. Giscard's promotes European solidarity as a platform for building peace and prosperity across national borders—an example of pursuing transnational interests instead of divisive narrow interests. 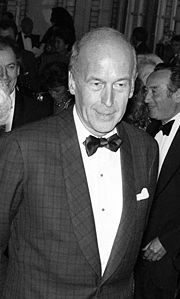 Valéry Marie René Giscard d'Estaing was born in Koblenz, Germany, the son of Jean Edmond Lucien Giscard d'Estaing (1894-1982), a civil servant. His wife, Marthe Clémence Jacqueline Marie (May) Bardoux, was a daughter of senator and academic Achille Octave Marie Jacques Bardoux and a great-granddaughter of minister of state education Agénor Bardoux, also a granddaughter of historian Georges Picot and niece of diplomat François Georges-Picot, and also a great-great-great-granddaughter of King Louis XV of France by one of his mistresses, Catherine Eléonore Bernard (1740-1769) through his great-grandfather Marthe Camille Bachasson, Count of Montalivet, and by whom Giscard d'Estaing was a multiple descendant of Charlemagne. Despite the addition of "d'Estaing" to the family name by his grandfather, Giscard is not descended from the extinct noble family of Vice-Admiral d'Estaing, that name being adopted by his grandfather in 1922, by reason of a distant connection to another branch of that family, from which they were descended with two breaks in the male line from an illegitimate line of the Viscounts d'Estaing. He studied at Lycée Blaise-Pascal in Clermont-Ferrand, École Gerson, and Lycées Janson-de-Sailly and Louis-le-Grand in Paris. He graduated from the École Polytechnique and the École nationale d'administration (1949-1951). He joined the Inland Revenue Service, then the staff of Prime Minister Edgar Faure (1955-1956). In 1962, while Valéry Giscard d'Estaing had been nominated Minister of Economy and Finance, his party broke with the Gaullists and left the majority coalition. The CNIP reproached President De Gaulle with his euro-scepticism. But Giscard refused to resign and founded the Independent Republicans (RI). It was the small partner of the Gaullists in the "presidential majority." However, in 1966, he was dismissed from the cabinet. He changed the RI into a new political party, the National Federation of the Independent Republicans (FNRI), and founded the Perspectives and Realities Clubs. He did not leave the majority but became more critical. In this, he criticized the "solitary practice of the power" and summarized his position towards De Gaulle's policy by a "yes, but…." Chairman of the National Assembly Committee on Finances, he harassed his successor in the cabinet. For that reason the Gaullists refused to re-elect him in this function after the 1968 legislative election. In 1969, unlike most of FNRI’s elected officials, he advocated a "no" vote in the referendum about the regions and the Senate, while De Gaulle had announced his intention to resign if the "no" won. The Gaullists accused him of being largely responsible for De Gaulle's departure. During the 1969 presidential campaign, he supported the winning candidate Georges Pompidou and returned to the Ministry of Economy and Finance. On the French political scene, he appeared as a young brilliant politician, and a preeminent expert in economic issues. He was representative of a new generation of politicians emerging from the senior civil service, whose profile was as "technocrats." In 1974, after the sudden death of President Pompidou, he announced his candidacy for the presidency. His two main challengers were François Mitterrand for the left and Jacques Chaban-Delmas, a former Gaullist prime minister. Supported by his FNRI party, he obtained the rallying of the centrist Reforming Movement. Moreover, he benefited from the divisions in the Gaullist party. Jacques Chirac and other Gaullist personalities published the "Call of the 43" where they explained Giscard was the best candidate to prevent the election of Mitterrand. He crushed Chaban-Delmas in the first round, and then narrowly defeated Mitterrand in the second with 50.8 percent of the vote. In 1974, he was elected President of France when he was 48, the third youngest president in French history, behind Louis Napoleon Bonaparte and Jean Casimir-Perier). He promised "change in continuity," and made clear his desire to introduce various reforms and modernize French society, which was an important part of his presidency. For instance, he reduced the age of majority from 21 to 18 and pushed for the development of the TGV high speed train network. In 1975, he invited the heads of government from West Germany, Italy, Japan, the United Kingdom, and the United States to a summit in Rambouillet, to form the Group of Six (now the G8, including Canada and Russia) major economic powers. He pursued a controversial course in foreign policy. In 1977, in the Opération Lamantin, he ordered fighter jets to deploy in Mauritania and go to war against the Polisario guerrillas fighting against Mauritanian military occupation of Western Sahara. But not even overt military backing proved sufficient to rescue the French-installed Mauritanian leader Mokhtar Ould Daddah, as he was overthrown by his own army some time later, and a peace agreement was signed with the Sahrawi resistance. Most controversial, however, was his involvement with the Bokassa regime of the Central African Republic and with a diamond smuggling scandal involving the dictator, by which he personally profited. Valéry Giscard d'Estaing was at first a friend of its ruler, Jean-Bédel Bokassa; he supplied Bokassa's regime with much financial and military backing. However, the growing unpopularity of that government led Giscard to begin distancing himself from Bokassa. In 1979, French troops helped drive Bokassa out of power and restore former president David Dacko. This action was also controversial, particularly since Dacko was Bokassa’s cousin and had appointed Bokassa as head of the military, and unrest continued in the Central African Republic, leading to Dacko being overthrown in another coup in 1981. In a related incident, Giscard was reported by the Canard Enchaîné to have accepted diamonds as personal gifts from Bokassa—who fled to France with looted millions from the Central African Republic's treasury, but was still given asylum in France. Presidential official gifts legally are property of the Republic of France, not the recipient. Giscard supporters contended that the diamonds were industrial-grade and thus had no sizable monetary value. In home policy, the president’s reforms worried the conservative electorate and the Gaullist party. A rivalry appeared with his prime minister Jacques Chirac, who resigned in 1976. Raymond Barre, called the "best economist in France," succeeded him. He led a policy of strictness in a context of economic crisis (Plan Barre). Unemployment grew. Unexpectedly, the right-wing coalition won the 1978 legislative election. Nevertheless, relations with Chirac, who had founded the Rally for the Republic (RPR), became more tense. Giscard reacted by founding a center-right confederation, the Union for French Democracy (UDF). 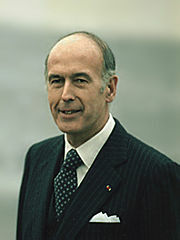 Giscard was defeated in the 1981 presidential election by Mitterrand. At the time, Chirac ran against Giscard in the first round of runoff voting and declined to call his voters to elect Giscard, though he declared that he himself would vote for Giscard. Since then, Giscard has always attributed his defeat to Chirac, and he is widely said to loathe him. Certainly, on many occasions, Giscard has criticized Chirac's policies, despite supporting Chirac's governing coalition. Although he said he had "deep aversion against capital punishment," he did not commute three of the death sentences that he had to decide upon during his presidency (although he did so on several other occasions), keeping France as the last country in the European Union to apply the death penalty. These executions would be the last ever in France. After his defeat, he retired temporarily from politics. In 1984, he regained his seat in Parliament and won the presidency of the regional council of Auvergne. In this position, he tried to encourage tourism to the région, founding the "European Centre of Volcanology" and theme park Vulcania. In 1982, along with his friend, former U.S. President Gerald Ford, he co-founded the annual AEI World Forum. He hoped to become prime minister of France during the first "cohabitation" (1986–88) or after the reelection of Mitterrand with the theme of "France united," but he was not chosen for this position. During the 1988 presidential campaign, he refused to choose publicly between the two right-wing candidates, his two former Prime Ministers Jacques Chirac and Raymond Barre. This attitude was interpreted by his will to re-conquer the UDF leadership. Indeed, he served as President of the UDF from 1988 to 1996, but he was faced with the rise of a new generation of politicians called the "renovation men." Most of the UDF politicians supported the candidacy of the RPR prime minister Édouard Balladur at the 1995 presidential election, but Giscard supported his old rival Jacques Chirac, who won the election. In 2000, he made a parliamentary proposition in order to reduce the presidential term from 7 to 5 years. President Chirac held a referendum on this issue, and the "yes" won. He did not run for a new parliamentary term in 2002. His son Louis Giscard d'Estaing was elected in his constituency. Following his defeat in the regional elections of March 2004, he decided to leave partisan politics and take his seat in the Constitutional Council as a former president of the Republic. Some of his actions there, such as his campaign in favor of the Treaty establishing the European Constitution, were criticized as unbecoming to a member of this council, which should embody nonpartisanship and should not appear to favor one political option over the other. Indeed, the question of the membership of former presidents in the Council was raised at this point, with some suggesting that it should be replaced by a life membership in the Senate. In 2003, Valéry Giscard d'Estaing was admitted to the Académie française, amid controversy; critics pointed out that Giscard had written only a single novel, Le Passage, of dubious quality. He has also served on the Trilateral Commission after being president, writing papers with Henry Kissinger. Valéry Giscard d'Estaing, throughout his political career, has always been a proponent of greater European union. In 1978, he was for this reason the obvious target of Jacques Chirac's Call of Cochin, denouncing the "party of the foreigners." From 2002 to 2003, he served as President of the Convention on the Future of Europe. On October 29, 2004, the European heads of state, gathered in Rome, approved and signed the European Constitution based on a draft strongly influenced by Giscard's work at the Convention. Although the Constitution was rejected by French voters in May 2005, Giscard continued to actively lobby for its passage in other European Union states. Speaking at the London School of Economics on February 28, 2006, he said that, "The rejection of the Constitutional treaty by voters in France was a mistake that should be corrected." Giscard opposes Turkey's joining the European Union because of Turkey’s geographic, ethnic and religious differences from the rest of Europe. He told Le Monde "that people who backed Turkey's accession were 'the adversaries of the European Union'." "In my opinion," he said, "it would be the end of Europe." Giscard d'Estaing gained some notoriety in the June 2008 Irish vote on the Lisbon Treaty. One quote of his in particular, retrieved from an interview he conducted with Le Monde in June 2007, that "public opinion will be led to adopt, without knowing it, the proposals we dare not present to them directly" was consistently highlighted by "No" campaigners as evidence of an alleged insidious agenda to fool the European public into accepting the text. However since this, he has denied making the statement in question, claiming that it was a mistranslation of what was speculation about the path that others may take the treaty without proper monitoring. His name is often shortened to "Giscard" or even "VGE" by the French media. A less flattering nickname is l'Ex (the Ex). He was the only surviving ex-president since he left office until the end of Jacques Chirac's term on May 16, 2007, with the exception of a brief period between François Mitterrand's retirement in 1995 and death in early 1996. On December 17, 1952, Giscard married his cousin Anne-Aymone Sauvage de Brantes, a daughter of Count François Sauvage de Brantes, who died in a concentration camp in 1944, and his wife, the former Princess Aymone de Faucigny-Lucinge. Their children are: Valérie-Anne, Marie-Aymone, Henri (Edmond Marie Valéry), Louis (Joachim Marie François) and Jacinte (Marguerite Marie). His son Louis is a French conservative Representative, and his son Henri is the President of the tourism company Club Méditerranée. In 2003, he received the Charlemagne Award of the German city of Aachen. He is also a Knight of Malta. He is an uncle of artist Aurore Giscard d'Estaing, who is married to the American actor Timothy Hutton. He travels the world giving speeches on European union. In 2005, he and his brother bought the castle of Estaing, a famous place in the French district of Aveyron and formerly a possession of the above mentioned admiral d'Estaing who was beheaded in 1794. The castle is not used as a residence but it has symbolic value. The two brothers explained that the purchase, supported by the local municipality, is an act of patronage. However a number of major newspapers in several countries questioned their motives and some hinted at self-appointed nobility and an usurped historical identity. There is little doubt that Giscard expected the failed Treaty to be his main political legacy, building on the vision of the European Union's founding fathers who had first spoken of the possibility of a United States of Europe. His most notable achievements as President was lowering the voting age to 18, increasing mixed education in schools and a leading role in establishing the European Monetary System. With the founding fathers of Europe, Giscard saw European integration as the only option for a Europe that wanted peace and prosperity; "after three bloody wars in seventy-five years," he said, "Western Europe knows it owes peace and prosperity to the bonds forged by European integration." As a politician, Giscard served not only his own country but the people of Europe in an effort to strengthen unity and solidarity, so that war remains not only "unthinkable but materially impossible" as set out in the founding document of what became the European Union. Giscard sees trade as a "weapon of peace," a term used by one of his advisers, Samuel Pisar. By linking his nation's interests with that of other nations, Giscard is an example of a leader who began to work for the peace, prosperity and security of all people, not just his own. ↑ Knapp and Wright (2006), 60. ↑ Cerny and Schain (1980), 171. ↑ EurActiv, Giscard: France's rejection of the Constitution was a "mistake." Retrieved December 20, 2008. ↑ BBC, Turkey's Entry "would destroy EU." Retrieved December 20, 2008. ↑ Jimmy Young, Sarkowzy Must be Told the EU Treaty is Dead and Buried, Sunday Express. Retrieved December 20, 2008. ↑ Rhiannon Harries, Valéry Giscard d'Estaing: The architect retreats to his castle, The Independent. Retrieved December 20, 2008. ↑ Valéry Giscard d’Estaing, Speech Elements: "The Henry Kissinger Lecture," The European Convention. Retrieved December 20, 2008. ↑ Europe Day, Declaration of 9th May. Retrieved December 20, 2008. Bassi, Michel. 1968. Valéry Giscard d'Estaing. Paris, FR: B. Grasset. Bertsch, Gary K. 1988. Controlling East-West Trade and Technology Transfer: Power, Politics, and Policies. Durham NC: Duke University Press. ISBN 9780822308294. Cerny, Philip G., and Martin Schain. 1980. French Politics and Public Policy. New York, NY: St. Martin's Press. ISBN 9780312305093. Derbyshire, Ian. 1990. Politics in France: From Giscard to Mitterand. Chambers political spotlights. Edinburgh, UK: Chambers. ISBN 9780550207487. Frears, J.R. 1981. France in the Giscard Presidency. London, UK: George Allen & Unwin. ISBN 9780043540251. Giscard d'Estaing, Valéry. 1977. French Democracy. Garden City, NY: Doubleday. ISBN 9780385130783. Knapp, Andrew, and Vincent Wright. 2006. The Government and Politics of France. London, UK: Routledge. ISBN 9780203003497. Parsons, Craig. 2003. A Certain Idea of Europe. Cornell Studies in Political Economy. Ithaca, NY: Cornell University Press. ISBN 9780801440861. Wright, Vincent. 1984. Continuity and Change in France. London, UK: G. Allen & Unwin. ISBN 9780043540282. History of "Valéry Giscard d’Estaing"
This page was last modified on 12 January 2009, at 17:14.